The average cost of memory care in Miami-Dade County is $2,640 per month. This is lower than the national median of $4,650. Caring.com has helped thousands of families find high-quality senior care. To speak with one of our Family Advisors about memory care options and costs in Miami-Dade County, call (855) 863-8283. Miami-Dade County covers a large swath of the southern tip of Florida, including the cities of Miami, Hialeah and Homestead. It's home to more than 2,751,796 people, of which 16 percent are aged 65 years or older. Many in this group are living with Alzheimer's disease or some type of dementia and are in need of residential memory care. Assisted living facilities offering extended congregate care (ECC) are licensed and regulated by the state to provide care for cognitive impairments. There are 10 ECC-licensed facilities in Miami-Dade County. Despite the large population and relentless traffic, Miami-Dade has good air quality, according to the American Lung Association. The county received two B scores, one for ozone pollution and one for particle pollution. Seniors with lung or C/V disease might get some relief by being in an area with clean air. Miami-Dade County is home to world-class medical facilities, including those specializing in brain health and dementia care, such as Baptist Hospital of Miami and Coral Gables Hospital, in the event of medical emergencies or illness. 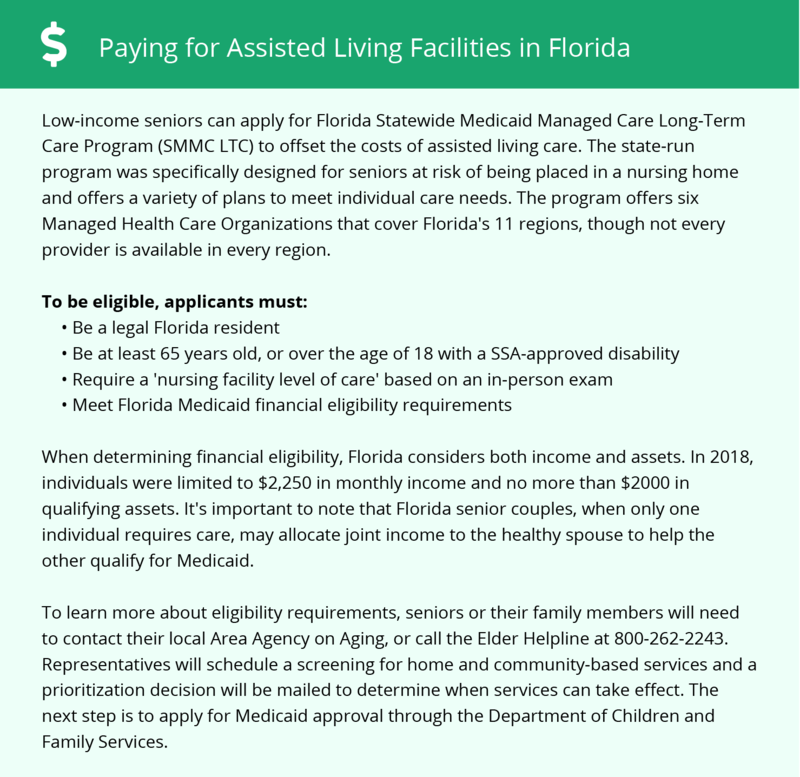 Because Florida does not have an income tax, families will see some extra money in their budgets for their senior relatives in an ECC facility. Due to its coastal location, Miami-Dade county averages 59 inches of rain per year, which is far above the U.S. average of 39. There are 248 sunny days per year in Miami, while the nation has only 205. Temperatures are pleasant year-round with summer highs of 90 and winter lows only 30 degrees less at 60. The county has a very high Sperling's Comfort Index of 93, only seven points off the perfect score of 100. Seniors with joint pain might find the climate to their liking. Memory Care costs in Miami-Dade County start around $2,640 per month on average, while the nationwide average cost of memory care is $4,800 per month. It’s important to note that memory care rates in Miami-Dade County and the surrounding suburbs can vary widely based on factors such as location, the level of care needed, apartment size and the types of amenities offered at each community. Miami Dade County and the surrounding area are home to numerous government agencies and non-profit organizations offering help for seniors searching for or currently residing in an assisted living community. These organizations can also provide assistance in a number of other eldercare services such as geriatric care management, elder law advice, estate planning, finding home care and health and wellness programs. To see a list of free memory care resources in Miami Dade County, please visit our Assisted Living in Florida page. Miami Dade County-area assisted living communities must adhere to the comprehensive set of state laws and regulations that all assisted living communities in Florida are required to follow. Visit our Memory Care in Florida page for more information about these laws.